Flash Tales is a collection of six short stories that provide wonder and entertainment. A beautiful, imaginative illustration by Fleur Camacho on the front cover invites readers to take a look inside. What a Clown Reads is a humorous and thought-provoking story. Author Chess Desalls has such an eloquent way with words—the description of events engages and includes the reader. The Floating Flautist is a very moving short story demonstrating sibling rivalry, but also the importance of preserving memories and treasures long after someone has passed. The story draws us in and we can almost hear the music. Trompette is a short, but complex story about the life of an instrument. I think Well Plaid is my favorite short story in the collection. A young girl shares a bit of herself to help someone whom she had previously saddened. They both end up happier when she presents the well plaid from her bed. Queen of the Small Seas is probably the longest—and best—short story in the collection, an excellent tale of pirates, kings, and curses that could be a book on its own. Boys and girls are going to feel for Maya, the main character who was cursed as a baby, raised by pirates, only to escape and discover her true identity. Morning and the Moon is a fable of animals that guide the moon to disappear in the morning so the sun can come out. Buy Flash Tales and get six wonderful stories for the price of one! 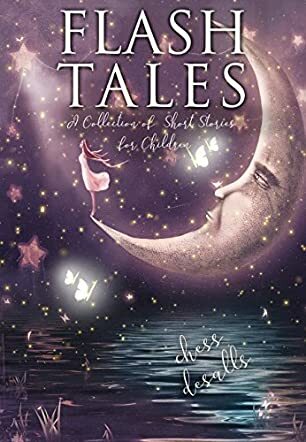 Author Chess Desalls has written a wonderful collection of six short stories—or tales—that will amuse and entertain both boys and girls.